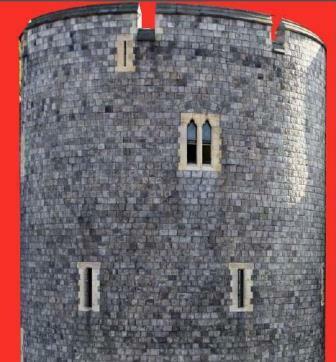 From Saturday 21 November the Christmas lights in Windsor town centre will include some projections onto Garter Tower – part of the Castle wall that faces Thames Street. 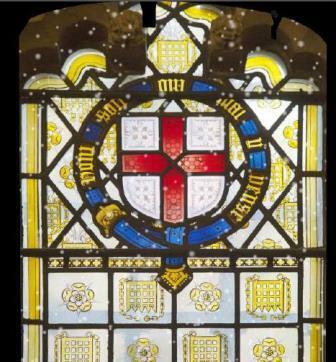 The projected images are taken from some of the stained glass windows of St George’s Chapel together with some of its unique architectural features and motifs from books in the Chapter Library. 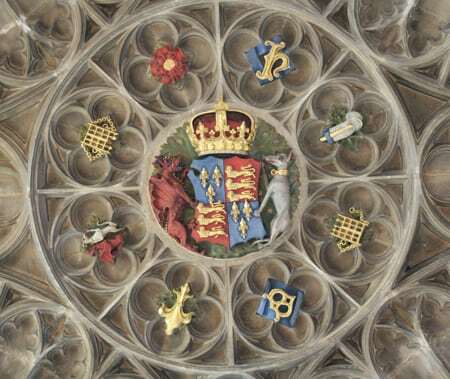 Many of the stained glass images are taken from the north and south quire aisles where there is a series of portraits of monarchs together with appropriate heraldic badges, coats of arms and decorative elements. 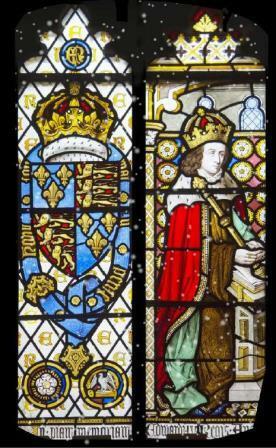 This stained glass window depicts King Edward IV. Although St George’s Chapel was begun by King Edward in 1475 the quire aisle stained glass is much more recent and dates from the 1840s/1850s. The person responsible was Thomas Willement. If you would like to see a glimpse of the much older west window please <click here>. For more information about Thomas Willement please see the <Archives blog>. 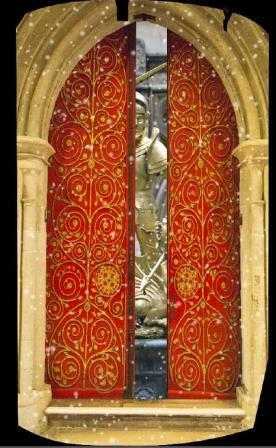 In addition to stained glass the light projections also include images of the organ pipes, the 13th century Gilebertus doors (photo above), the gilded figure of St George in the Dean’s Cloister, roof vaulting and bosses. For the first time this year there are images from some of the books and music manuscripts held in the Chapter Library. Over the next few weeks the Chapel Facebook (stgeorgeswindsor) page will feature individual images with some explanatory text. If you would like to see the Chapel in person please note that it is normally open to visitors Monday to Saturday 10am to 4pm via the Castle admission centre though there are some different closure times over Christmas. Details, together with Christmas Services, are included in this leaflet <click here>.